Apathetic, sombre, downcast are not usually emotions you would associate with a must win league game ahead of a Wembley Semi-Final at the weekend, but that’s how it felt on the Kop last night. Even before the game there was a real sense of anti-climax. The reds had been on a terrific run in the league, but it all seemed to have blown up in the last two games. The defeats to United and Arsenal were disappointing to say the least. The former in particular was worse in my view, because I fully expected us to win. A struggle at the Emirates was always on the cards, but even so, the manner of the defeat was gut-wrenching. Of course this week we mark our 26 year fight for truth and justice, while standing shoulder to shoulder with the bereaved and the survivors of Hillsborough. I always find the mood at Anfield around this time to be, well all of the above. Football seems a little irrelevant this time of year. The cab ride to the game was entertaining though. I actually prefer it when the cabbie is a blue. I love it when they pretend to be fair minded football supporters with not a hint of bitterness or obsession about them. The ride became a bit of a sparring match, with both of us pretending to be respectful of each others teams, while managing to get a few digs in here and there. He managed a reference to the terrible cost of going to Anfield, especially when you add in your air fair. I managed to get in a crack about Everton selling half season tickets, before steering the conversation towards his thoughts on Martinez. The game its self started with promise. The Reds looked to be playing some decent football, and on 9 minutes were a goal up. Henderson was the creator this time, sending a delightful pass right onto Sterling’s boot. The youngster controlled the ball brilliantly, danced through a couple of challenges before finishing sublimely into the bottom right corner. Newcastle’s Tim Krull was excellent on the night, but he could do nothing about that goal. The celebrations in the stands seemed to be more about relief than jubilation though. Anything other than a win at this stage of the season would effectively end any lingering hopes of top four. To get a goal so early on, might have prompted Newcastle to have a go and create more opportunities to score. Around me the feeling was that this could end up being a big score. Let’s face it we haven’t really given anyone a mauling this season. Maybe tonight was the night when we at least made our goal difference look a little respectable. Or maybe not! As the half wore on so too did the lingering suspicion that this could be another one of those games. Liverpool looked good, but again we lacked any kind of cutting edge. The Geordies were there for the taking, but we never looked like making it comfortable. Hearts sank on 45 when Ayoze Pérez looked certain to score from the centre of the box. Thankfully Mignolet saved to his left. Fortunately Abeid shot high into the Kop from the resulting corner. With the arrival of half-time, Newcastle will have felt they were well and truly in the game. Yet again Liverpool had failed to make their dominance count and a tense second half beckoned. It was obvious that Carver had got into his team at the interval. He’d have told them at 1-0 this Liverpool team are vulnerable, especially after back to back defeats and with some of the players having one eye on Wembley. To be fair to them they gave it a real go as the second half got under-way. A couple of corners and a number of chances were wasted, but there was always a fear they could nick an equalizer. Sterling missing a gilt-edged chance from three yards out, with Krull at his mercy, did little to ease the tension. It had actually been easier for him to score than miss. Maybe I’m being harsh. In my view, Sterling’s performance epitomised where he is in his career right now. He is a wonderfully gifted talent, capable of sublime skill and finishing. He is not the finished article, nor should we expect him to be. He is 20 and still learning about life and football. I believe he will go on to justify his agents exorbitant demands, in time. For now though he still has a lot to learn. Raheem spoke this week about his admiration for the Kop. He dreamed of a day when they would sing a song about him. Last night they obliged. Sterling may have smiled when he heard it, I doubt his agent would have. The crowd at Anfield are still wonderfully inventive and irreverent and the ode to Raheem’s advisors last night was the perfect response to the players carefully orchestrated interventions into the media. They also showed, once again that when it comes to respect and sportsmanship they are second to none. 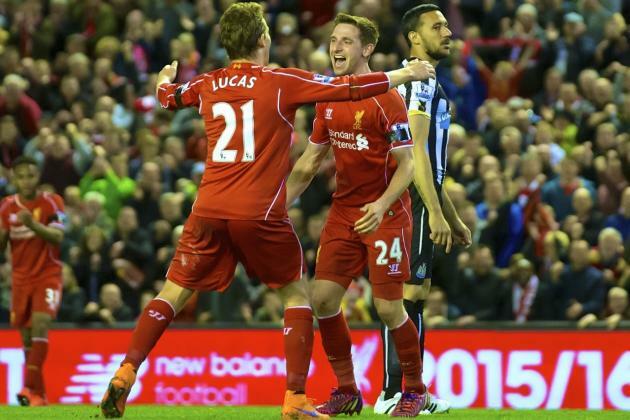 As Jonas Gutierrez entered the fray on 67 minutes the whole of Anfield stood to applaud. John Bishop said it showed “football still had a soul”. The watching media praised the crowd for their class and knowledge of the game. It was a magnificent gesture, but nothing compared to the strength and determination showed by the player in achieving his comeback at the highest level. In the 70th minute victory was finally sealed with a very rare goal from Joe Allen. He will have relished his goal in front of the Kop as much as we did. It was a great finish and the celebrations on the pitch showed beyond doubt that there is still a team ethic in the Liverpool dressing room. All that remained was for the Reds to see out the 90 with a confidence boosting clean sheet. Thankfully Sissoko made the task a little easier with his desperate lunge at Lucas late in the game. He was already walking before the referee reached for his card and well he might. It ended up being a second yellow, but it probably should have been a straight red. Full time came and, with 3 points in the bag, thoughts turned to Wednesday once again. Another painful day of remembrance lies in the way of what will hopefully be, in the word of one survivor, a wonderfully cathartic day out at Wembley. I second that emotion.